Protein Blend (Whey Protein Concentrate, Whey Protein Isolate, Whey Protein Hydrolysate, Micellar Casein, Egg White Protein), Sprinkles (Sugar, Corn Syrup, Corn Cereal, Corn Starch, Hydrogenated Palm Oil, Natural and Artificial Flavor, Red #40, Yellow #6, Blue #1, Yellow #5), Glutamine Blend (L-Glutamine, Glutamine Peptides), Inulin, Natural And Artificial Flavors, Creamer (Sunflower Oil, Corn Syrup Solids, Sodium Caseinate, Mono & Diglycerides, Dipotassium Phosphate, Tricalcium Phosphate, Soy Lecithin, Tocopherols), Gum Blend (Xanthan Gum, Guar Gum, Carrageenan), Sucralose, Acesulfame Potassium, Enzyme Blend (Aminogen®, Lactase). Add one rounded scoop of STACKED PROTEIN to 6oz of your favorite liquid such as water, skim milk or unsweetened almond milk. Stir with a spoon or shake in a cup for 15-20 seconds until protein powder fully dissolves. Before consuming STACKED PROTEIN seek advice from a physician if you are unaware of your current health condition, have any pre-existing medical condition, taking any medication, planning any medical procedure, contemplating pregnancy, pregnant, or nursing. Reduce or discontinue use if any adverse reactions occur such as but not limited to gastrointestinal discomfort. 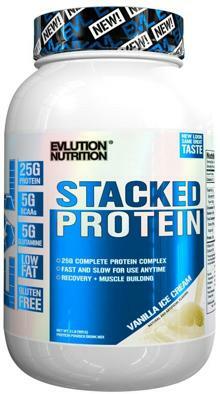 STACKED PROTEIN is only intended to be consumed by healthy adults 18 years of age and older. Keep out of reach of children and pets. Do not exceed the recommended daily dose. Should not be used as a substitute for a varied diet. Protein Blend (Whey Protein Concentrate, Whey Protein Isolate, Whey Protein Hydrolysate, Micellar Casein, Egg White Protein), Cocoa (Processed With Alkali), Glutamine Blend (L-Glutamine, Glutamine Peptides), Natural And Artificial Flavors, Creamer (Sunflower Oil, Corn Syrup Solids, Sodium Caseinate, Mono & Diglycerides, Dipotassium Phosphate, Tri-Calcium Phosphate, Soy Lecithin, Tocopherols), Inulin, Gum Blend (Cellulose Gum, Xanthan Gum, Carrageenan), Sucralose, Enzyme Blend (Aminogen®, Lactase), Acesulfame Potassium. Protein Blend (Whey Protein Concentrate, Whey Protein Isolate, Whey Protein Hydrolysate, Micellar Casein, Egg White Protein), Natural And Artificial Flavors, Amino Acid Blend (L-Glutamine, Glutamine Peptides), Inulin, Gum Blend (Cellulose Gum, Xanthan Gum, Carrageenan), Enzyme Blend (Aminogen, Lactase), Sucralose, Acesulfame Potassium. Before consuming STACKED PROTEIN® seek advice from a physician if you are unaware of your current health condition, have any pre-existing medical condition, taking any medication, planning any medical procedure, contemplating pregnancy, pregnant, or nursing. Reduce or discontinue use if any adverse reactions occur such as but not limited to gastrointestinal discomfort. STACKED PROTEIN® is only intended to be consumed by healthy adults 18 years of age and older. Keep out of reach of children and pets. Store at room temperature. Before consuming STACKED PROTEIN seek advice from a physician if you are unaware of your current health condition, have any pre-existing medical condition, taking any medication, planning any medical procedure, contemplating pregnancy, pregnant or nursing. Reduce or discontinue use if any adverse reactions occur such as but not limited to gastrointestinal discomfort. STACKED PROTEIN is only intended to be consumed by healthy adults 18 years of age and older. Keep out of reach of children and pets. Store at room temperature. Before consuming STACKED PROTEIN® 100% WHEY seek advice from a physician if you are unaware of your current health condition, have any pre-existing medical condition, taking any medication, planning any medical procedure, contemplating pregnancy, pregnant, or nursing. Reduce or discontinue use if any adverse reactions occur such as but not limited to gastrointestinal discomfort. STACKED PROTEIN® 100% WHEY is only intended to be consumed by healthy adults 18 years of age and older. Keep out of reach of children and pets. Store at room temperature. Notice: Use this product as a food supplement only. Do not use for weight reduction. Protein Blend (Whey Protein Concentrate, Whey Protein Isolate, Whey Protein Hydrolysate, Micellar Casein, Egg White Protein), Cookie Crumbs (Enriched Wheat Flour (Wheat Flour, Niacin, Reduced Iron, Thiamin, Riboflavin, Folic Acid), Sugar, Palm Oil, Cocoa (Processed With Alkali), Contains 2% or Less of the following: High Fructose Corn Syrup, Caramel Color, Soy Lecithin, Chocolate Liquor, Salt, Leavening (Baking Soda, Ammonium Bicarbonate), and Corn Starch), Glutamine Blend (L-Glutamine, Glutamine Peptides), Inulin, Natural And Artificial Flavors, Creamer (Sunflower Oil, Corn Syrup Solids, Sodium Caseinate, Mono & Diglycerides, Dipotassium Phosphate, Tri-Calcium Phosphate, Tocopherols), Gum Blend (Cellulose Gum, Xanthan Gum, Carrageenan), Sucralose, Enzyme Blend (Aminogen®, Lactase), Acesulfame Potassium. Protein Blend (Whey Protein Concentrate, Whey Protein Isolate, Whey Protein Hydrolysate, Micellar Casein, Egg Albumen), Glutamine Blend (L-Glutamine, Glutamine Peptides), Inulin, Natural And Artificial Flavor, Soy Lecithin, Gum Blend (Xanthan Gum, Guar Gum, Carrageenan), Cinnamon Powder, Sucralose, Enzyme Blend (Proteases [Aminogen®], Lactase), Acesulfame Potassium. Before consuming STACKED PROTEIN® seek advice from a physician if you are unaware of your current health condition, have any pre-existing medical condition, taking any medication, planning any medical procedure, contemplating pregnancy, pregnant, or nursing. Reduce or discontinue use if any adverse reactions occur such as but not limited to gastrointestinal discomfort. STACKED PROTEIN® is only intended to be consumed by healthy adults 18 years of age and older. Keep out of reach of children and pets. Store at room temperature. Notice: Use this product as a food supplement only. Do not use for weight reduction. Protein Blend (Whey Protein Concentrate, Whey Protein Isolate, Whey Protein Hydrolysate, Micellar Casein, Egg White Protein), Cookie Crumbs (Enriched Wheat Flour, Wheat Flour, Niacin, Reduced Iron, Thiamin, Riboflavin, Folic Acid), Sugar, Palm Oil, Cocoa (Processed with Alkali), Contains 2% or Less of the following: High Fructose Corn Syrup, Caramel Color, Soy Lecithin, Chocolate Liquor, Salt, Leavening (Baking Soda, Ammonium Bicarbonate, and Corn Starch), Glutamine Blend (L-Glutamine, Glutamine Peptides), Inulin, Natural and Artificial Flavors, Creamer (Sunflower Oil, Corn Syrup Solids, Sodium Caseinate, Mono & Diglycerides, Dipotassium Phosphate, Tri-Calcium Phosphate, Soy Lecithin, Tocopherols), Gum Blend (Cellulose Gum, Xanthan Gum, Carrageenan), Sucralose, Enzyme Blend (Aminogen®, Lactase), Acesulfame Potassium. Protein Blend (Whey Protein Concentrate, Whey Protein Isolate, Whey Protein Hydrolysate, Micellar Casein, Egg White Protein), Cocoa (Processed With Alkali), Amino Acid Blend (L-Glutamine, Glutamine Peptides), Natural And Artificial Flavors, Creamer (Sunflower Oil, Corn Syrup Solids, Sodium Caseinate, Mono & Diglycerides, Dipotassium Phosphate, Tri-Calcium Phosphate, Soy Lecithin, Tocopherols), Inulin, Gum Blend (Cellulose Gum, Xanthan Gum, Carrageenan), Sucralose, Enzyme Blend (Aminogen, Lactase), Acesulfame Potassium. Protein Blend (Whey Protein Concentrate, Whey Protein Isolate, Whey Protein Hydrolysate, Micellar Casein, Egg White Protein), Cookie Crumbs, Amino Acid Blend (L-Glutamine, Glutamine Peptides), Inulin, Natural And Artificial Flavors, Creamer (Sunflower Oil, Corn Syrup Solids, Sodium Caseinate, Mono & Diglycerides, Dipotassium Phosphate, Tri-Calcium Phosphate, Soy Lecithin, Tocopherols), Gum Blend (Cellulose Gum, Xanthan Gum, Carrageenan), Sucralose, Enzyme Blend (Aminogen, Lactase), Acesulfame Potassium. Stacked Protein combines the highest quality protein available with best taste possible. All without the high fat and carbs found in some other products. Nothing else offers so many benefits! Once you make the switch, you will never go back!